The time to sign up for this item / event has ended. Contact the sign up creator for assistance. The time to make changes to this sign up have ended. Contact the sign up creator for assistance. Use this form to sign up for your shift at PaBREWcah Beer Fest! PaBREWcah is the the largest fundraising event for the Paducah Symphony Orchestra. 2019 marks our 4th annual event, and it keeps growing! That means we need more and more volunteers each year. It will take approximately 170 volunteers to make this event run smoothly. - A $5 GA ticket so you can enjoy the festival before/after your shift! Volunteer tickets can be purchased the day of the event at the volunteer tent. IMPORTANT: If you sign up for Brew Crew, we ask that you attend a quick, painless volunteer training prior to the event. This is to ensure things run smoothly at the festival. If you already know you absolutely cannot attend a training (you're from out of town, etc) go ahead and sign up, but please email us at [email protected] and let us know. You only need to attend one training. Be on the lookout for an email from us in early May about trainings if you have signed up to serve beer. 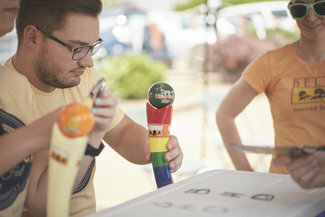 To learn more about PaBREWcah Beer Fest, visit pabrewcah.com. To learn more about the Paducah Symphony Orchestra, visit paducahsymphony.org. The sign up creator has set a maximum quantity limit of 2 for this sign up. You have reached the quantity limit setup by the sign up creator. You are not allowed to sign up for more than 2 total items on this sign up .